Exclusive Offer by Ebay: Earlier we post about a eaby offer to get Sandisk 16GB PenDrive at Just Rs.79 from ebay, after that post we again find a amazing deal from ebay and here we talking about same. In this deal you will get flat Rs.200 off on orders of Rs.200 or more, with free shipping, so checkout below how you can grab this deal. Goto Ebay webiste and create new account. Browse categories and select any product you want to purchase. Select only product which price is Rs.200 or above or Checkout our suggestion below. You will get instent discount of Rs.200. Fill shipping details. and place order. Make payment of remaining amount if you are purchasing more then Rs.200. 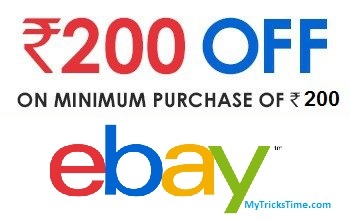 The offer valid for New Ebay Users only. Valid on 18th Dec,2015 from 12:00Hrs onward. Shipping charges may be additional on some product.